This weekend, I tackle the roses. Bud eyes are already swelling even as flowers open, like on durable, fragrant—and in my case neglected—Iceberg, a white floribunda that I’ve never fertilized! 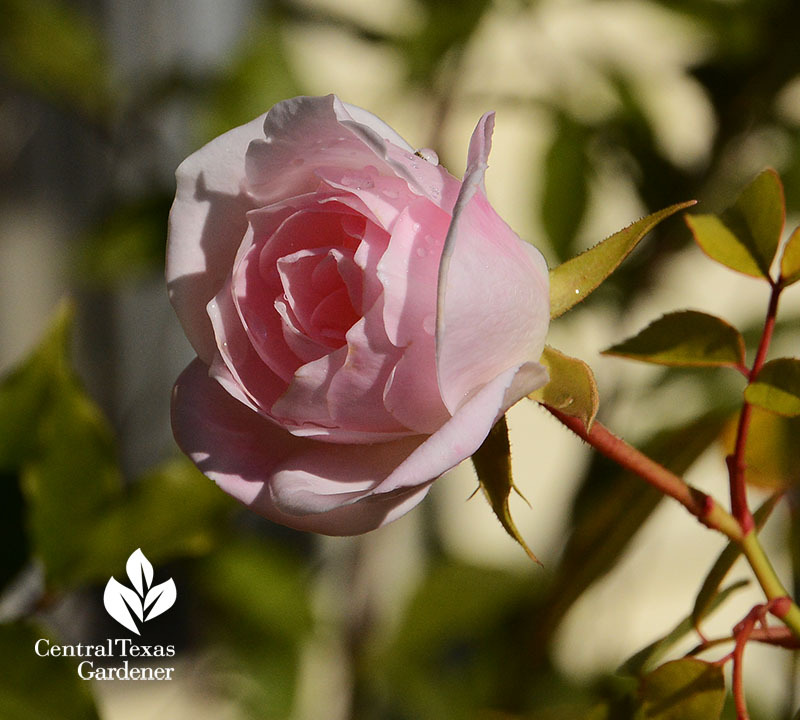 Cold weather nips have stopped some flower buds in their tracks, but pruning now won’t be a problem and make for prettier, healthier plants. I cut these to enjoy indoors when this week’s cold front came through. This really has been the best year in a long time for the lettuce bed. 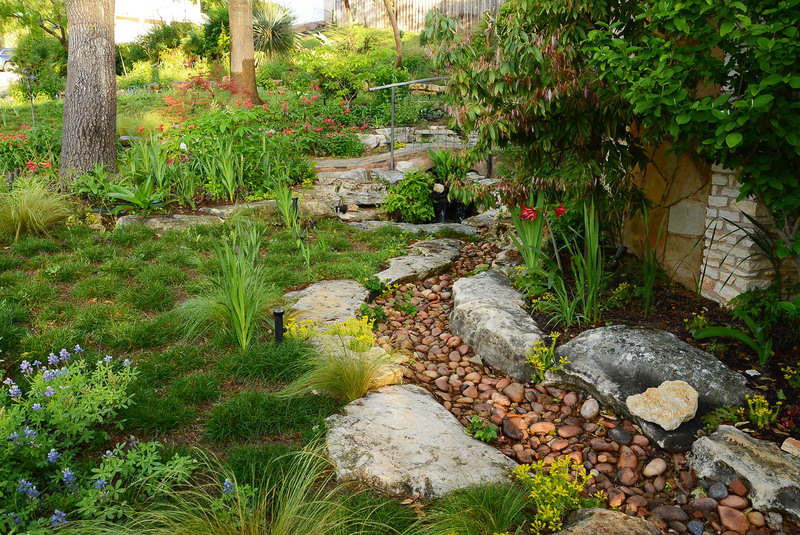 Cool weather and rain last fall favored seeds and transplants both. 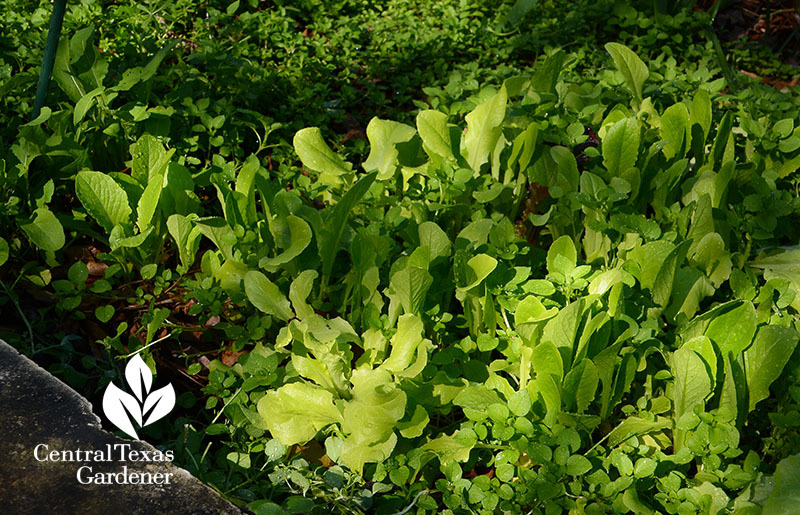 Chickweed threatens to outrace them and nearby arugula, parsley and cilantro, but that’s okay. I snip them to add to our salads and our indoor bunnies’ fresh greens. 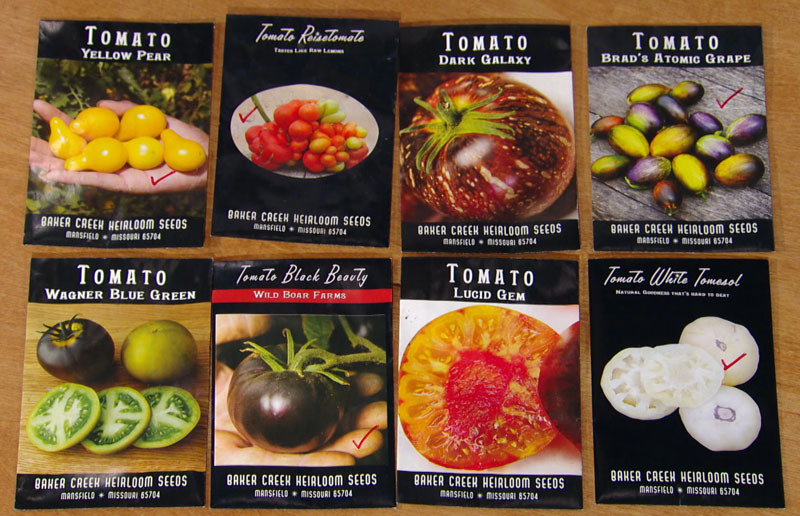 It’s not too late to start tomato seeds indoors, but you do need to get a jump on it. 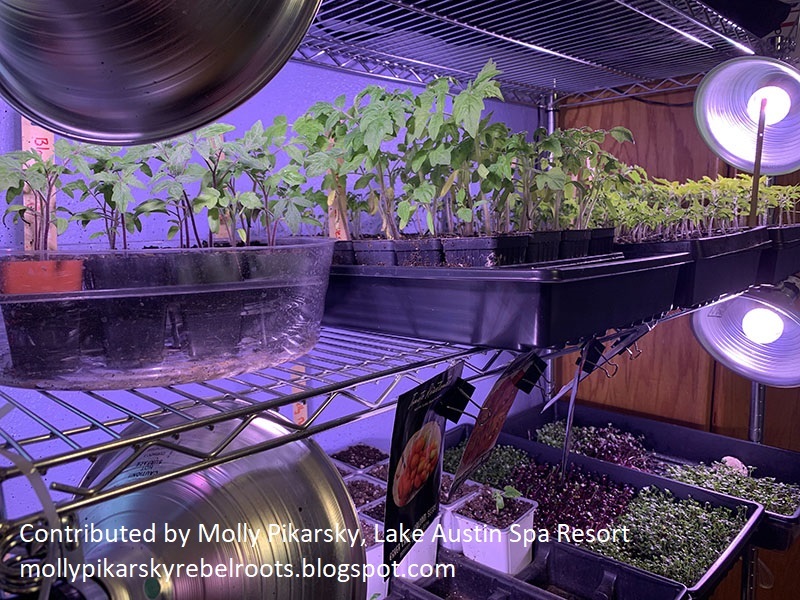 Molly Pikarsky, the new Flora and Fauna Manager at Lake Austin Spa Resort, explains how she starts seeds in her office and why she prefers varieties that originated in hot, dry climates. 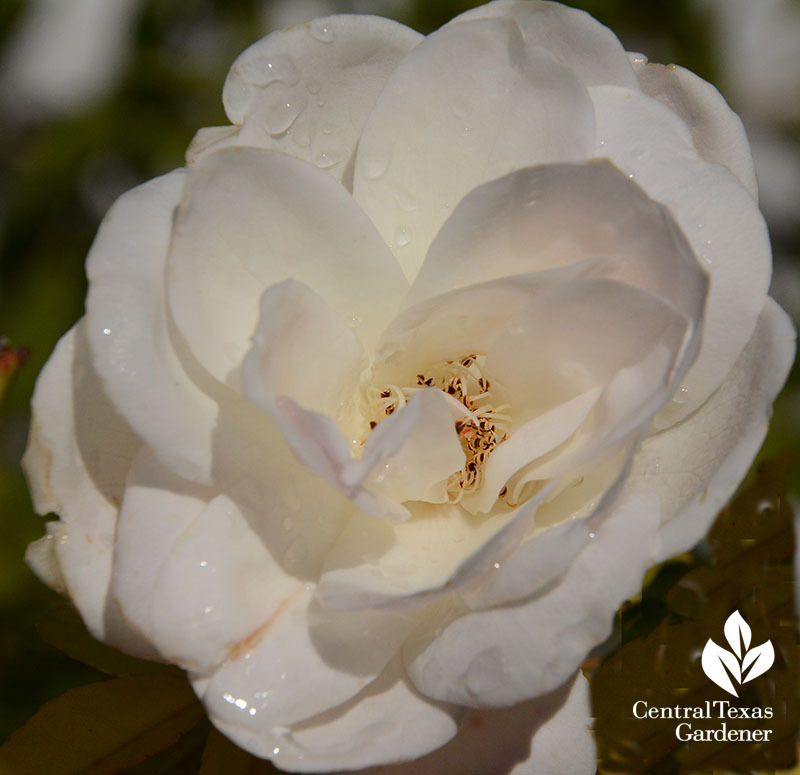 If you’d rather get nursery transplants, they’ll be in nurseries soon, but don’t let warm days fool you! You can pot them up and keep them warm for now. Watch now! 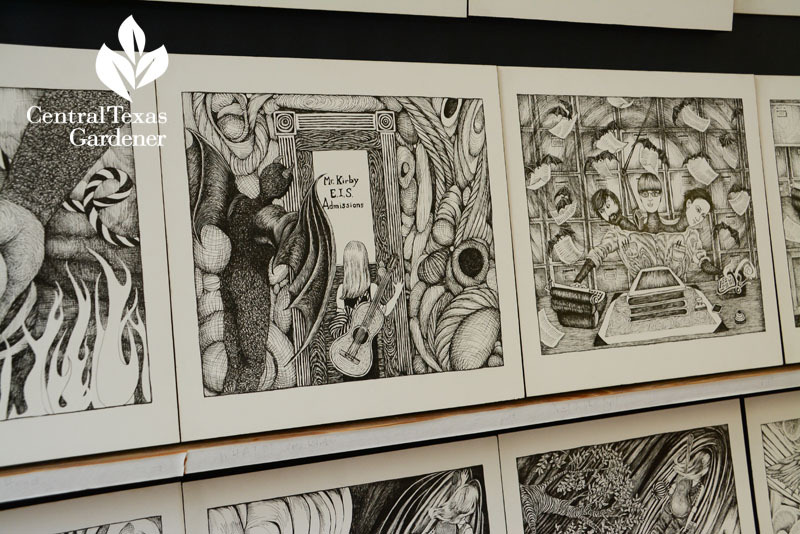 Molly’s also germinating her blog, Rebel Roots, where she’ll update us on her adventures. 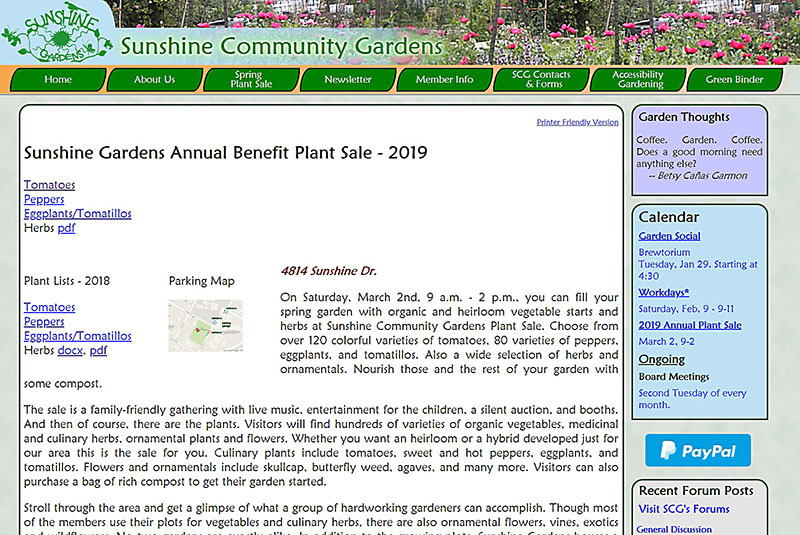 Sunshine Community Gardens holds their popular tried-and-true vegetable and flower plant sale on March 2 from 9 a.m. – 2 p.m. 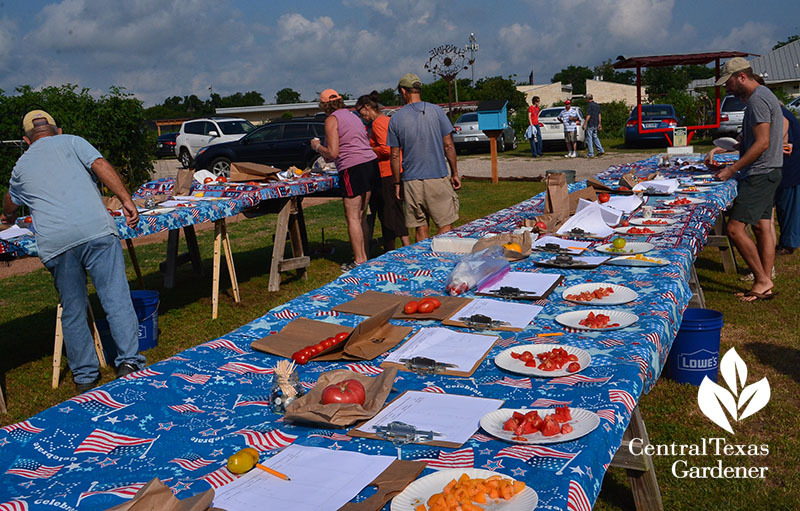 Along with their exacting growing tests, every summer’s tomato tasting contributes to the ultimate analysis: taste! Here’s the 2019 list. 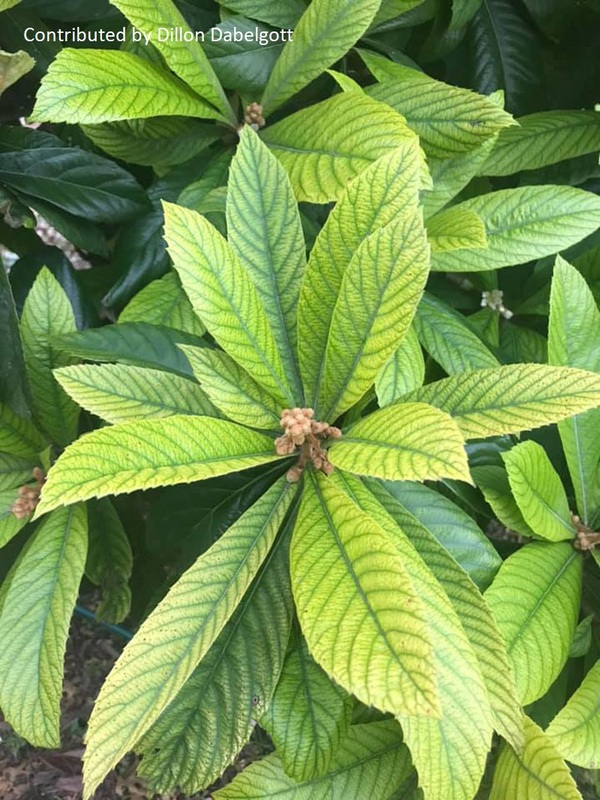 Now, what’s wrong with Dillon Dabelgott’s loquat? He’s got two of them, but only this one’s suffering. 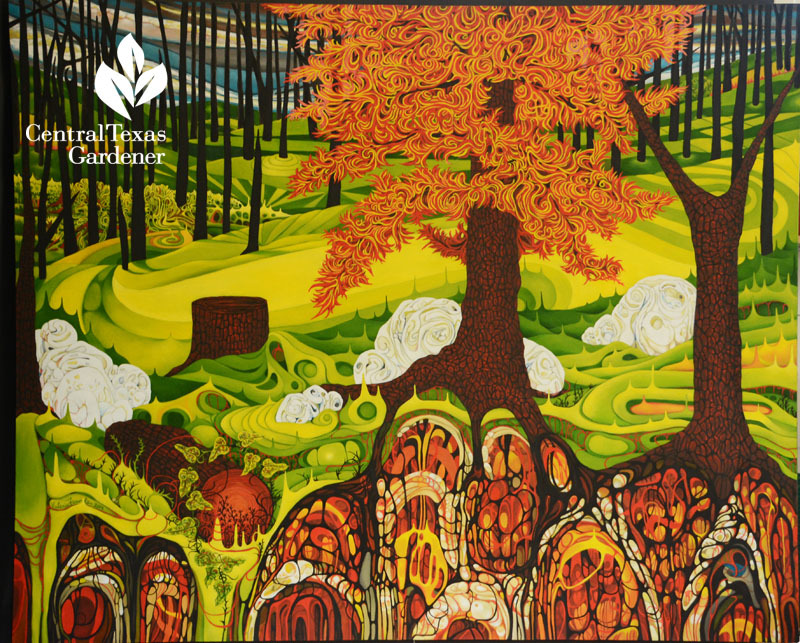 Daphne explains that it could be iron chlorosis and possibly why only one is affected. I get a lot of questions about fertilizing trees. 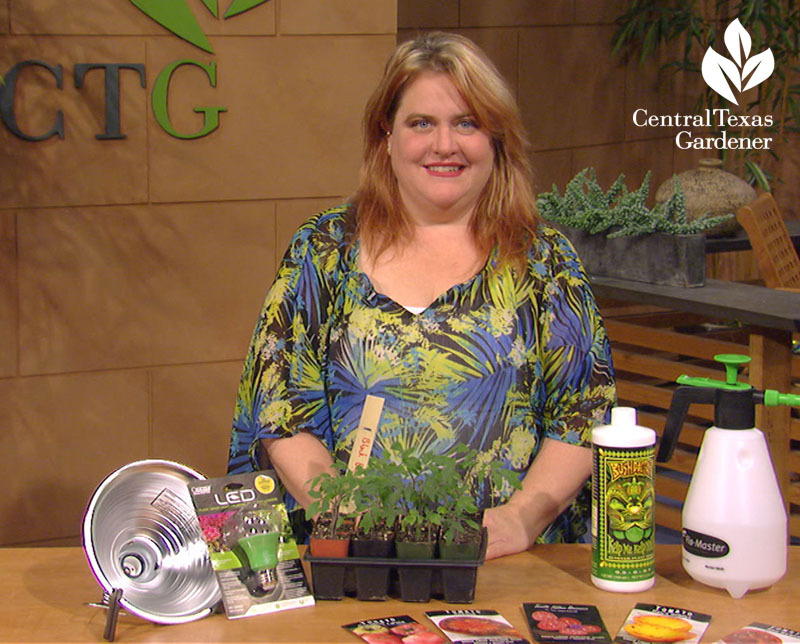 Certified arborist April Rose, Austin Urban Forest Health Coordinator, explains the pros and cons of home-broadcast fertilizers and tree service deep-root injections. 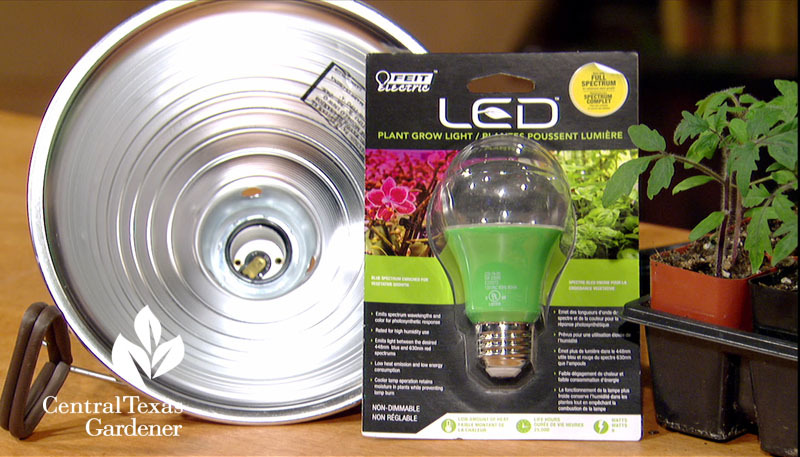 But first, she asks, “Do you need to fertilize instead of simply adding compost?” Watch now. 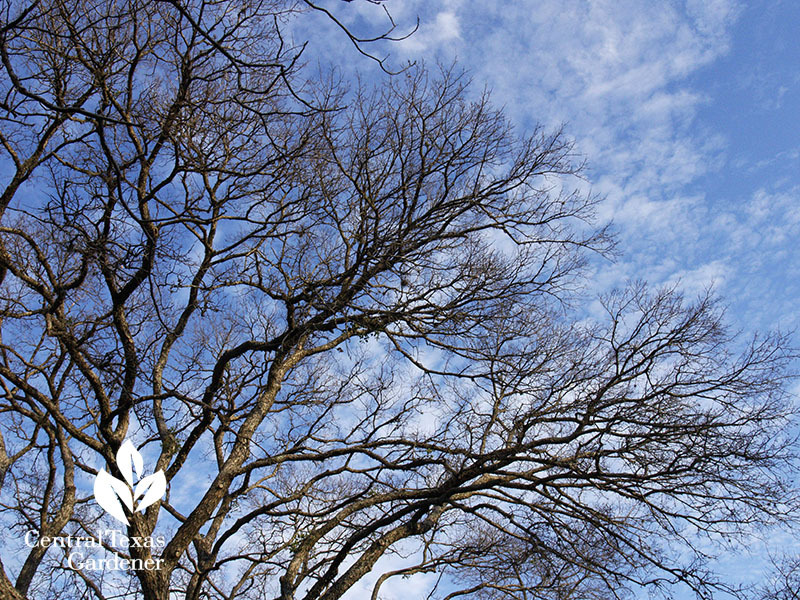 Now, how can we design our gardens to be less at risk to fire? 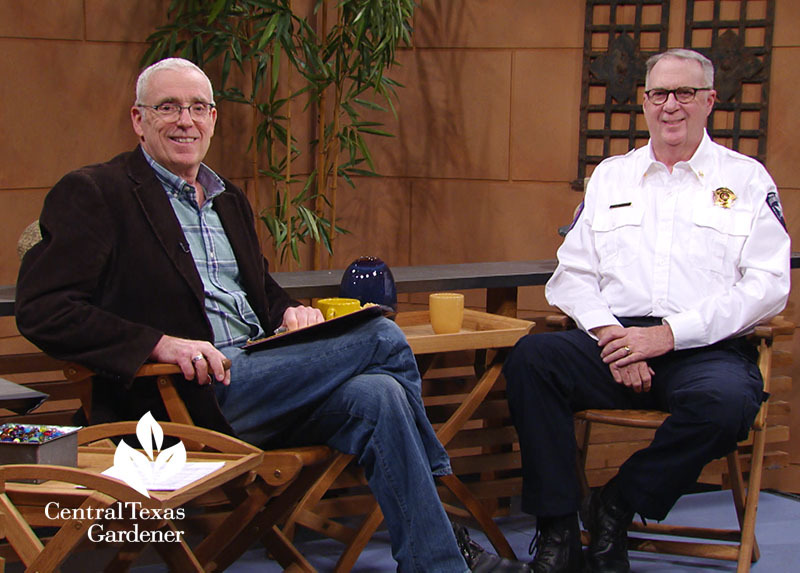 Get proactive tips with Will Boettner from the Travis County Fire Marshal’s Office. Watch now! 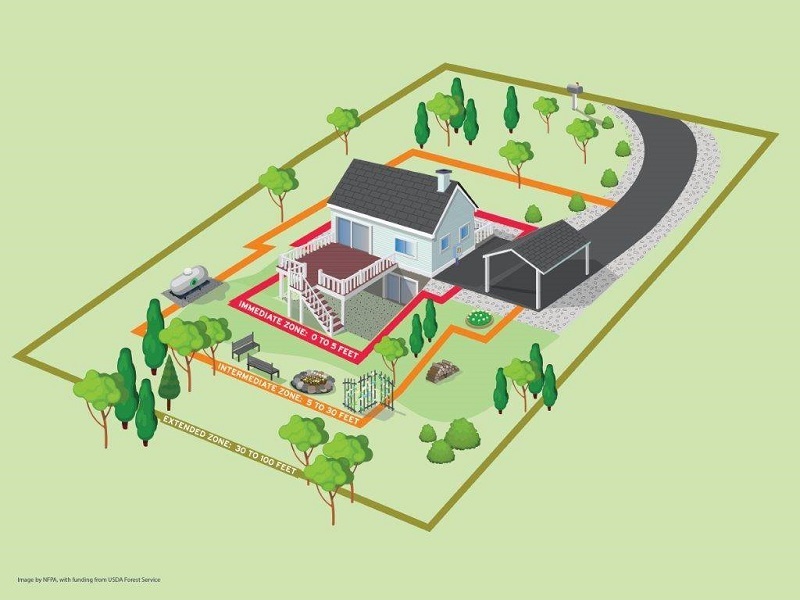 Get easy home and garden safety tips and downloadable fact sheets from The National Fire Protection Association! 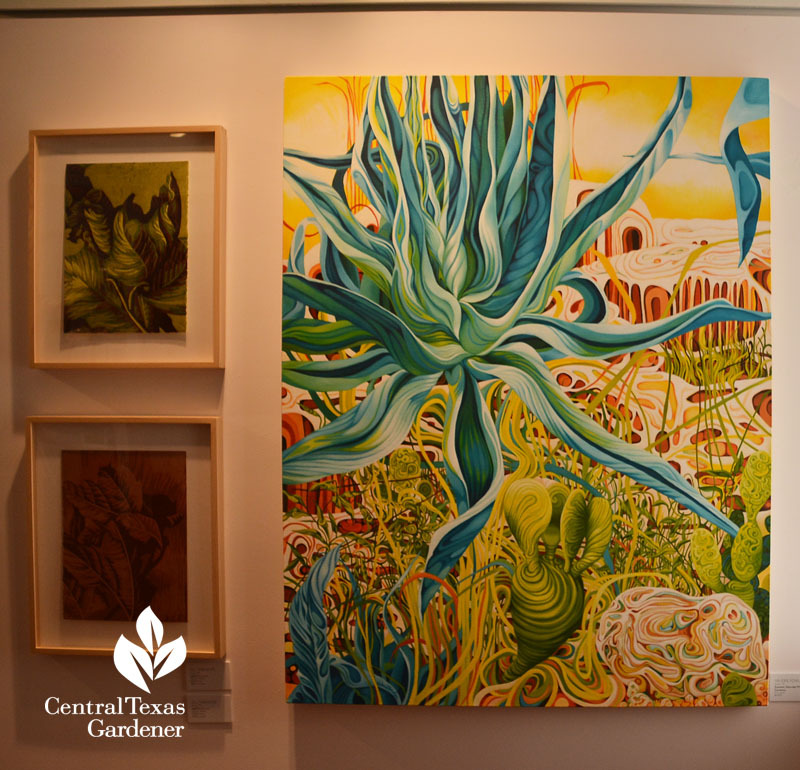 The Bastrop fire inspired artist Valerie Fowler to document fiery rebirth. 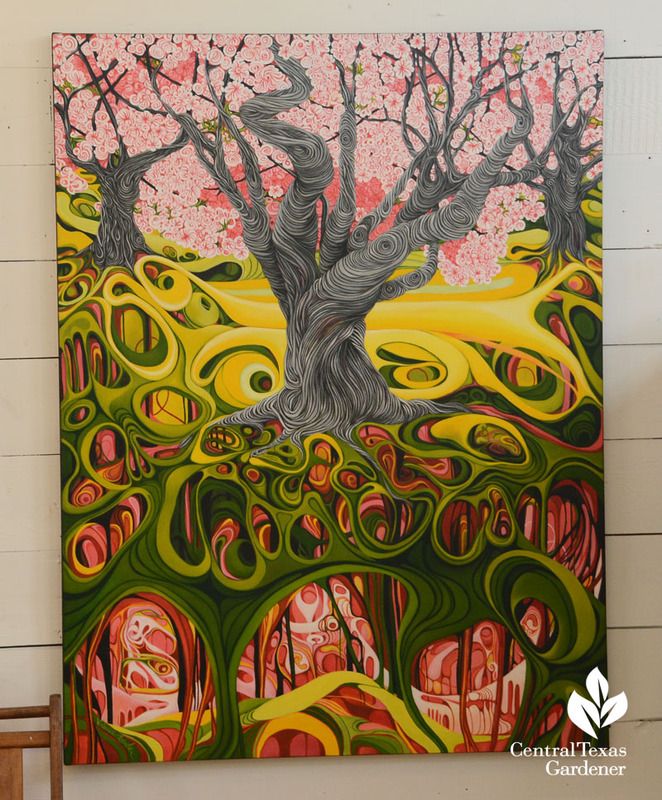 Sweet peach blossoms in Fredericksburg inspired a symbolic connection between their ephemeral beauty and her daughter’s fleeting youth. 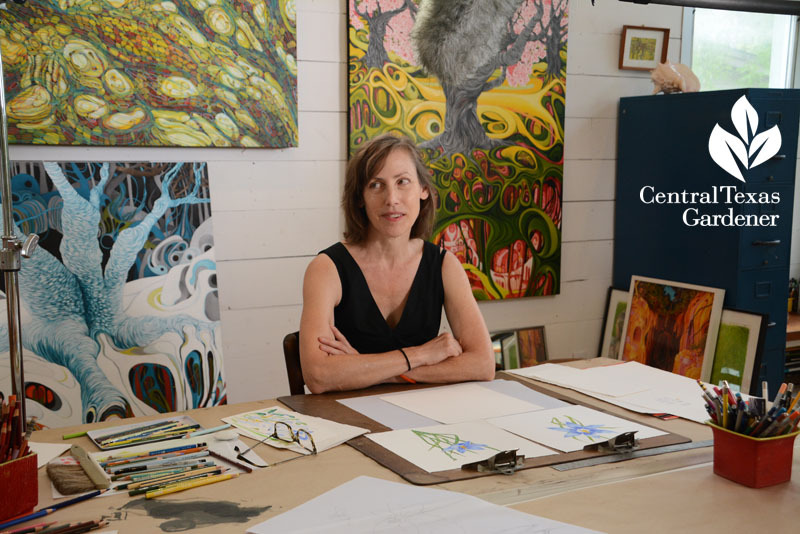 On tour, Valerie’s poignant stories explain how her children and nature inspired a new (and ever evolving) direction in her work. 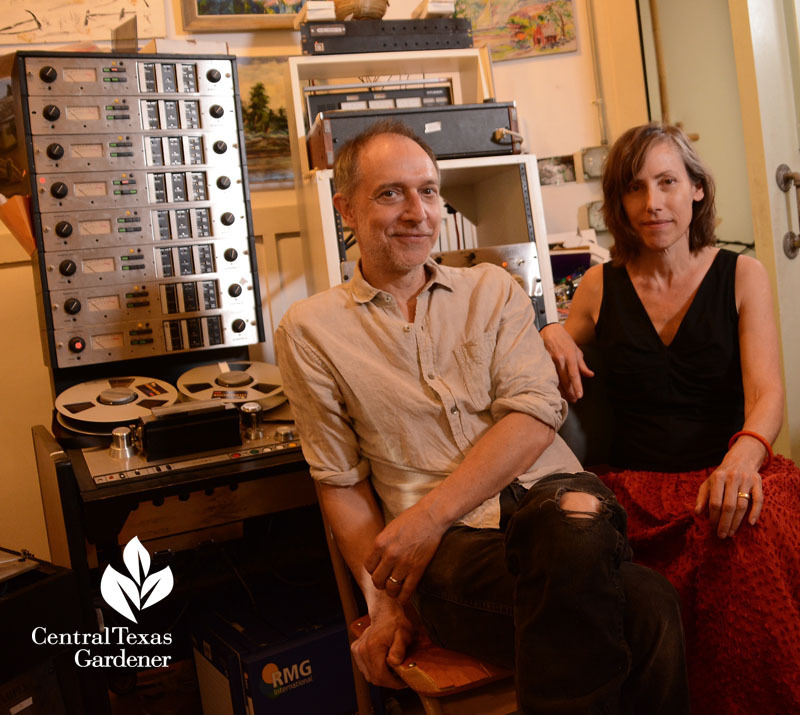 She and equally thoughtful husband Brian Beattie, record producer, musician and audio engineer, unite in creativity—as individuals and in collaboration where each brings a unique perspective. Watch this powerful story now!